For $2,300, Could This 1988 Acura Legend Be A Legendary Value? Today’s Nice Price or Crack Pipe Legend is claimed to come with receipts for over forty grand in maintenance over the course of its life. Let’s see if its current price might make for a receipt also worth keeping. Do you know what the pirate said when he became an octogenarian? Aye matey! Talking like a pirate is fun. Also fun would be driving last Friday’s 2008 Audi R8, and as a pirate you would obviously refer to it as an Arrrr-Eight. You also wouldn’t have to feel bad about giving up so much of your booty to buy it as it took home a 57% Nice Price win. It’s interesting that we romanticize pirates while while we don’t roving bands of road bandits or corporations that undertake hostile takeovers. In fact when someone wants to be seen as taking an extreme risk or thinking outside the box they often times raise the traditional skull and crossbones pirate flag as a symbol of their separation from the norm. That’s what Steve Jobs did when his team was developing the Macintosh which as we all know went on to redefine Apple and the computer industry. Another game changer that could have been developed under the Jolly Roger was Honda’s bold step into the upper echelons of the automotive market. Having established themselves as the makers of some of the most desirable and respected small and frugal cars, the company launched Acura here in the States and in Canada in 1986 as a luxury brand. This was the first new Japanese brand to be introduced here by an existing player as well as the first aspirational marque to give owners of the Hondas someplace to go as they gained affluence and demanded something a little more hoity-toity. 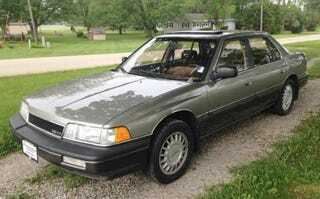 This 1988 Acura Legend looks to be a fine example of that upscale product. The first generation Legend looked a lot like a big Accord, which wasn’t a bad thing since Honda couldn’t build their family haulers fast enough, but it was bigger in every way, and more fancy in a few. If you want a good history of the model—along with its sad English cousin, the Rover 800—Ate Up With Motor’s is one of the most comprehensive and interesting you’ll ever read. Don’t go there now however because we still have much to discuss about this 230,000-mile (yes, 230K!) five-speed four door. First off, when was the last time you saw one of these in this nice or shape? Wait, let me rephrase that, when was the last time you saw one of these? Yeah, I don’t even see them in the junk yard all that much any more. If you do see one, nice or not so, it’s unlikely to sport this one’s desirable five-speed stick, as most of these came over here with a luxury-portending automatic. That gearbox is claimed in the ad to shift smoothly, and the 176-bhp C27A SOC V6 to run great. The A/C is also said to be working, Ice cold in fact, and there’s a new cat-back exhaust. Newish tires are wrapped around factory alloys that are described as unmarred, and you get a trunk full of extra OEM parts to go along with the car so clear out both a space and a shelf in your garage when bringing this bad boy home. Aesthetically you probably couldn’t ask for more. The two-tone grey exterior looks excellent in the photos, and the cloth interior seems to have held up admirably as well. There is an aftermarket stereo inside while one the outside there are dealer window caps, but other than that, it seems pretty factory. There’s also a ton of receipts covering all of the car’s maintenance over the years, in case you’re looking for something to leaf through. GoodReads gives it four and a half stars. The asking price is $2,300 and I’m guessing I already know which way the vote is headed, but I’ll throw this to you anyway. What’s your take on this Legendary survivor and that $2,300 price? Does that seem like a no-brainer? Or, is there something about this car that just makes that price seem too high? QuadCities Craigslist, or go here if the ad disappears. H/T to Sethism for the hookup!